Weeks seem to fly by so quickly here in Mongolia! One week ago today we celebrated Rachelle’s birthday. Sarah and Rebekah wanted to make a favorite dish of homemade lasagna for the birthday lunch. I think lasagna noodles are starting to become available in Mongolia, but the girls decided to save some money and make them from scratch. Carefully rolled out and then dried on a bed sheet, you could hardly tell the difference in the final product. Some of the younger ones served the lunch in a fine dining style comparable to an expensive catered banquet. Not everything has been fun and celebration, however. Isaac’s lower leg has been painful and swollen, keeping him in bed for most of the past week. It seems that some type of infection had set in. We are grateful to know some skilled missionary doctors here, and one was able to examine his leg and prescribe an antibiotic. Yesterday Isaac began taking another antibiotic of a stronger type, and it seems that he is beginning to show some signs of improvement. Please continue to pray that the Lord would give him a rapid recovery. You may remember that our phone system had died a little over a month ago. We were able to send it to the States, where we are getting it repaired, either for us to use again, or for another branch of our organization. Riding in a taxi through the city on Thursday, I was telling Ideree that I am seeking the Lord’s direction for our phone system needs. Even before it failed, we were talking about maybe upgrading at some point. We are currently renting 11 apartments, but the TalkSwitch only has 8 extension. It is a great little system, but starting to get a little small. The Lord could have easily allowed the unit to continue working for a few more months or years, but He allowed us to come to a decision point this summer. From one perspective, we could have the unit repaired for $250, and have it shipped back to us, but we would be in exactly the same situation, minus $250. I am wondering if maybe the Lord has a plan or direction in this that is bigger than just spending money on a repair. In researching some options for a possible replacement for the TalkSwitch, I was encouraged to investigate what is available locally. It would be wise to get something that is supported locally, with parts available for any repairs. Following the recommendation of the repairman, we visited the office of the main Panasonic distributor in Mongolia. We were ushered into the office of a well dressed man that spoke good English. He explained that Panasonic has installed over 15,000 systems in Mongolia over the past 5 years, and is the primary supplier for small and mid-sized businesses. Taking some time to learn of our needs, he went on to describe a system that he felt would work well for us, and gave me a product brochure. I asked if he might have any older systems that might be available at a lower price, so he also gave me a product brochure for the previous model. Returning to our apartment, I spent an hour or so researching these units on the Internet. I also remembered an e-mail that a friend had sent me last week. He does phone system installations, and had used Panasonic unit that might work for us. Stopping to look up the part number on the Internet, I found to my great surprise that it was exactly the model described in the second brochure from the Panasonic distributor! All of the details have not yet come together, but it seems that we might be able to get a good quality, locally supported phone system with double the capacity of our TalkSwitch for less than the cost of the repair! I sent some e-mails to verify the details on this, but it will be exciting to see what the Lord does. Another answer to prayer came just as unexpectedly as Ideree and I were looking at phone systems. As I was walking into one of the stores, I saw another tall foreigner, and it turned out to be Ewen, the man that I have been assisting with the Mongolian Bible software! I knew that he was back in the country, but had not seen him since my return. We had a brief talk, and it gave me all the more encouragement to move forward with the project. Please continue to pray for us! Your prayer support is so vital to this or any other ministry. Without God’s hand of blessing on our work, we would simply be running around in circles. 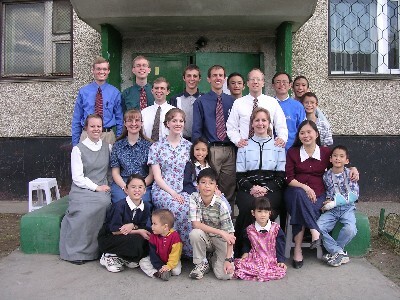 – Praise the Lord for how the church is continuing to grow in Mongolia. Last Sunday the Holy Way church that we attend divided (or multiplied) into two different churches. The old building just could not fit the 200+ people that were attending each week. We were wondering if anyone had stayed with the old building and original church when about 150 people gathered at the new location. We heard later that the old building was also full! Five people came to Christ at each church last Sunday. – Pray for a full recovery for Isaac’s leg. We are grateful to begin seeing some improvement today. – Please pray for the wife and three young children of Enkhbayar, a Mongolian pastor of another church that went home to be with the Lord a few hours ago. In the midst of the grief of Enkhbayar’s passing, many of the unsaved relatives want to have a Buddhist funeral, against the wishes of his wife and a document he wrote before his death. 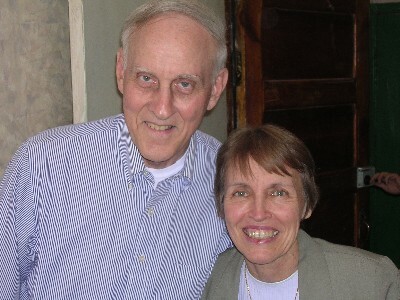 Jim and Esther Entner just came to Mongolia last year after over 20 years of mission work in the Philippines. We are so blessed to know this dear couple, and Jim’s medical experience and advice has been of great assistance in the situation with Isaac’s leg. Having the family here brings a new dynamic to local outreach. 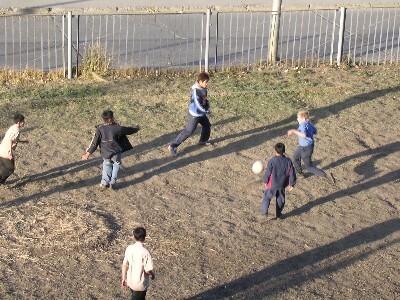 Quite a number of the Mongolian boys in the area are getting to know David and the younger ones. Soccer seems to be their favorite outdoor activity. Derrick and company. Chinggis (left) and Dorjbat (right) have been assisting with the remodeling project. 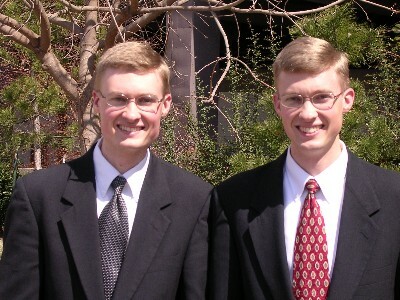 These two young men are growing in the Lord and actively involved with our church. 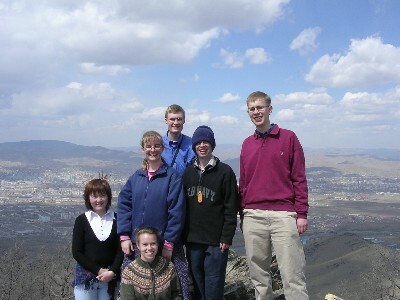 Thank you so much for your prayers for the family and team in Mongolia! 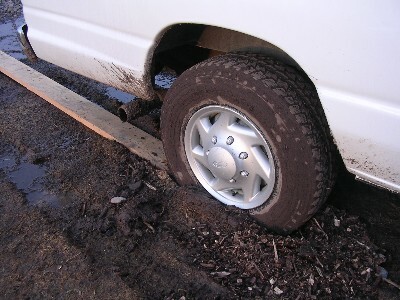 Several days ago I was talking with a missionary that works in the countryside, a nine hour drive by 4WD vehicle. He had come into the city to gather supplies for the next few months of work in a remote town West of Ulaanbaatar. Relating some of his recent experiences with the local people, he shared about a Mongolian man that I will call George. Living in the Mongolian countryside, this man was just trying to get enough income to meet basic needs. A few months ago, George came to Christ. It was shortly after this decision that his race horse suddenly started winning championships. He went on to sell this prized horse for the equivalent of two years worth of income! Talking with the missionary about it, George said “The Lord has really blessed me as a Christian!” It would be hard to disagree, but my missionary friend was a little concerned. God does sometimes choose to bless His children with material possessions, but this is not always the case. It would be very easy for George to stand on the hillside, looking over his new flocks of sheep, cattle and horses, and think back on his decision to trust Christ with the feeling that it was probably the best decision he ever made. When God chooses to bless a Christian in this way, there is the danger that he will become distracted by the gift, and forget the Giver. The thing that began as such a blessing can become the very distraction that leads him away from a close relationship with the Lord. In some ways I almost feel like George as I look at the opportunities that God has opened up before us. Some missionaries in Mongolia, like my aforementioned friend, are under restrictions from the local government, and are not allowed to share their faith outside their own home. In contrast, we are sharing the gospel message with people almost weekly, and hearing many reports of people coming to Christ. Every few days it seems that we have the opportunity to counsel and encourage local Christians, or visit with missionaries. Finishing our first month of regular character classes at the Mongolian International University, we are seeing deepening relationships with many of the students. One young man wanted to talk with David after class on Wednesday. After a question on the lesson, he began asking about Christianity. Gathering several friends in the cafeteria a little later, he asked David to share more about the Gospel message. He is reading the Bible, and wants to talk further when they get the chance. Pray for Ogii. He is not far from the Kingdom of God. We are currently teaching all 250 of the freshmen and sophomore students at MIU, but others have been asking if they can join the class. Some of the older students asked if we are going to teach the juniors and seniors in the upcoming semester. Just last week a second World Vision Area Development Project Leader came to ask us if we could do regular character trainings for her staff. Teaching bi-weekly character training lessons to 50 law students at one of the most noted law schools in the nation has further expanded our regular teaching schedule. Several churches and Christian groups have also asked if we can begin teaching on the Commands of Christ and character with a Christian emphasis. While originally intended for the encouragement of local missionaries, our bi-monthly Family Nights of Christian teaching and fellowship have expanded to over 40 adults and 25 children. With so many things to be busy doing, it is easy to forget being who God wants us to be. The account of Job is a good example of how quickly material things can change, and one does not have to think very hard to realize how quickly opportunities and ministry can change. If our joy is fixed on our relationship with the Lord, then we have a joy that no man can take from us. When we have open doors and ministry opportunities before us, let us go forward, but let us never forget that vital relationship that keeps us strong for the race before us. – Puja and Erdenee’s wedding was a powerful testimony of a dedicated Christian couple that waited on God’s timing and the blessing of their parents for their courtship and marriage. Puja’s parents came to the Lord last year, and they have had some good discussions with Erdenee’s family in the past few weeks. – One of the great joys that I have had in working in Mongolia is to be able to help people in the area of computer skills. A few days ago I finished replacing a failed hard drive in a laptop computer for a missionary family. We were very thankful to recover all of their documents from the partially readable drive. – In the process of applying for work permits and visas, we seem to have generated some misunderstandings with one of the Labor Office staff. Ziyaa was planning to visit our office for the past couple weeks but has not been able to come yet. We are actually glad for the opportunity to show her who we are, and what we are involved in. Pray that we would have a good meeting with her, and that she would have a clear understanding of our purposes and activities in Mongolia. – For the past several weeks, I have been wanting to move forward on the Mongolian Bible software project. Up to this point I have not had much time to work on it. Pray that the Lord would give grace and favor as I meet with the Mongolian Union Bible Society to discuss copyright and distribution. I am really hoping that we can have permission to freely distribute this Bible software in Mongolia. For David’s birthday, we enjoyed a family hike up a nearby mountain. 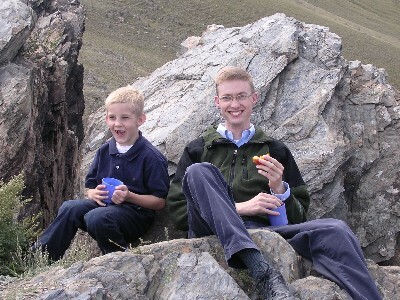 Here Isaac and Matthew enjoy some peaches and trail mix on a nice soft rock. The view from the top was quite spectacular. 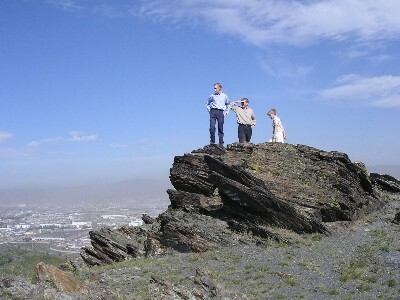 Here David, Dad and Rachelle look out over the city of Ulaanbaatar. The Lord answered prayer in giving us a beautiful day for the birthday hike. 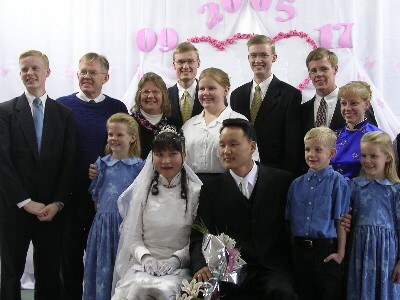 The Waller family poses for a picture with the new couple. 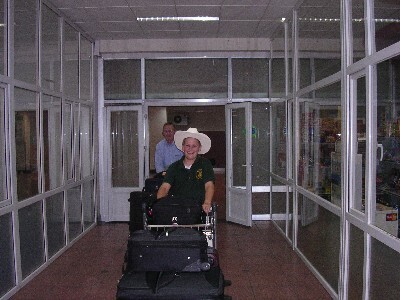 Puja is wearing a traditional Mongolian dell (the white garment), while some of the men wore a cowboy type hat. I took this picture a few minutes ago from the balcony of my apartment. 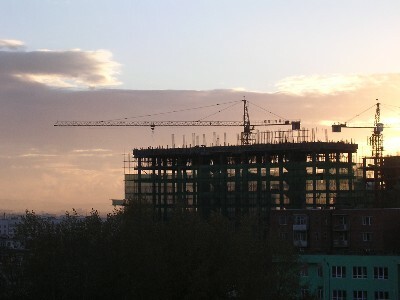 There are many of new buildings being built in Ulaanbaatar, and construction crews are working around the clock to finish before winter. Mom and the younger ones have begun school for the year. Today I was invited to be the special guest instructor for the computer history chapter of their workbook. Thank you so much for praying for each of us! Thank you for your prayers for our team last month! We faced a great deluge of unexpected difficulties and challenges, but the Lord poured out His grace and we are going strong. John 15 teaches us that we have a loving Father that sometimes takes us through seasons of pruning and purging, that we might bear even more fruit for Him. Like a grape vine that is carefully pruned and dressed by the husbandman, God sometimes takes us through difficulties and trials, so that we might experience a greater measure of His love and faithfulness. God’s love for us is far deeper than just our present circumstances. Like gold that is refined in a fire, or like a valuable pearl that is created by an irritating grain of sand, God wants us to show His character in us through the suffering He allows in our lives. I have not written in several weeks, but this was not for lack of desire to keep you informed. Unexpected difficulties and needs seem to have been coming from all directions, revealing priorities and testing character. After working very well for the first month, our wireless Internet connection began experiencing difficulties as we tried to send and receive e-mails. After many days and hours of troubleshooting, we learned that this had been caused by some changes that our service provider had made. After a few weeks they were able to resolve the problem, and the connection worked great, -for about three days. We then began to experience further connection problems which still have not been resolved. I don’t mind troubleshooting these kinds of things, and enjoy the learning involved, but it can be difficult when you have other pressing responsibilities needing your time. A number of unexpected computer issues have also come up recently. One of our main workstations suddenly would not start up one morning. It took the better part of a day to identify the problem as a malfunctioning modem, and to rebuild the computer system. Last week I was made aware of some strange things happening with a couple of the computers, and when I finally got around to checking things out a few days later, I discovered a computer virus on our network. It took Jedidiah and I about four hours, working late into the evening to eradicate the virus. Yesterday I sat down to begin planning for the children’s seminar this weekend, when I learned that our printer was not working. After about an hour I had identified and corrected the problem, but was not very prepared for the meeting to discuss the children’s seminar program. This morning my brother came up to the office to tell me that the phone system was not working. Apparently during a couple phone calls this morning, the system suddenly went dead, and we could not get a dial tone from any of the phones. After resetting the system, I began to be a little concerned when the faithful little TalkSwitch would not start up. I disassembled it for further troubleshooting, but it seems that after five years this phone system has breathed it’s last, or at best, would need some parts from America. This will likely leave us for the next few days or weeks without the ability to call between our apartments. These and a number of other issues have brought an accumulation of challenges unlike what I have seen before. I remember times of great challenge or pressure, but usually not from so many directions all at the same time. As we discussed today in our noon prayer meeting, I wonder how many of these things are pointing towards the Anger Resolution Seminar we are holding this weekend. In the past I have often seen how some of our greatest difficulties were just before the greatest advancements in our work and ministry for the people of Mongolia. It is for this reason that I am writing, to encourage you to pray with us in this important time. This Friday and Saturday we are holding an Anger Resolution Seminar and Children’s Institute. This is the first time that we are holding this seminar in Mongolia, and I am excited to see how the Lord will use it in the lives of those that come to hear God’s ways of resolving root issues that cause anger. (See: http://www.iblp.org/iblp/seminars/anger/) We do not have many people registered at this point, but several calls in the past couple days seem to indicate a growing interest. I don’t want to leave you discouraged. Although most of this update describes some of our recent challenges, I want you to know that God is also working in the midst of all these things. A couple weeks ago I felt prompted to do a backup of the primary data on our computer network. I had no idea that just a few days later a computer virus would invade the network and destroy some of our files. So far I have not identified any damage that could not be replaced from our backups. 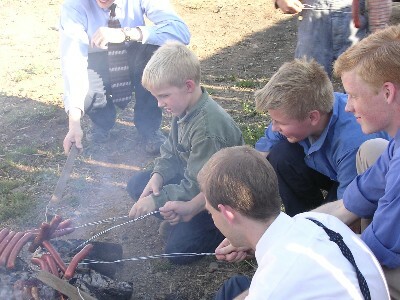 Having the Spiritual gift of serving, I greatly enjoy the opportunity to assist others, and especially missionaries, using the computer skills that the Lord has entrusted to me. Last week we received a call from a friend at the New Tribes Missions headquarters. An 8 hour jeep ride beyond the last paved road and train station, Jeremy and Roxi are serving in the countryside hometown of our Pastor Enkhee and his wife Sodnom. Their laptop computer suddenly crashed one day, and they have been unable to get it started up again. I could only imagine the frustration of being so many miles away from help beyond what they could do on their own. Reaching them by phone, I walk them through some troubleshooting steps which seemed to indicate a failed hard drive. They are sending the computer into the city with another family today, so I hope to look at it further in the next few days. Some of you may remember that I have been involved in a project to make the Mongolian Bible available on the computer. Although my time has been very limited, I have been praying about this project, and the Lord seems to be opening up the way to move forward. We are potentially a few weeks away from the first widespread distribution of Mongolian Bible Software. I am looking forward to the day when I can prepare CDs to give away. Requests for trainings continue to come in. Tim just came back from a meeting with the Mongolian International University leaders. They invited us to come and teach their 250 freshmen and sophomores twice a week. A representative from another school just came a few days ago with a request to do monthly trainings for their teachers. Several more requests are likely to come in the next few weeks as the school year begins. Please continue to pray for us! There is so much happening, and we greatly need the Lord’s wisdom as we move forward. May the Lord bless each one of you for your part in this work! – For the many requests and opportunities that are before us! We need wisdom in knowing how to best focus our energies and efforts. – For the safe arrival of my brother Derrick on the 16th of August. 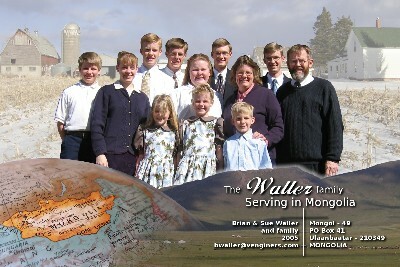 Now our entire family is together again, serving with the Character Training Institute in Mongolia. – For the many opportunities to further develop computer skills as I troubleshoot computer and Internet issues. Although the timing is sometimes interesting, it is a very effective way to learn. – For the Anger Resolution Seminar and Children’s Institute this weekend. Pray for extra grace and enthusiasm as I lead the children’s program. – Pray for wisdom as I work on Jeremy and Roxi’s computer. We would like to recover the data from the old hard drive, but this can be difficult to do. 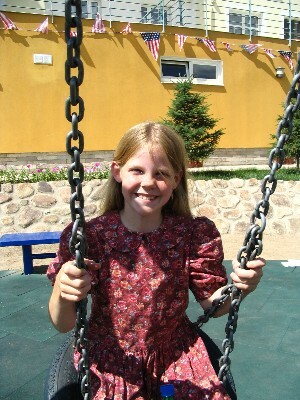 A large stadium next to our building provides a nice area for the younger ones to get some exercise. Here Matthew connects solidly with the ball in our kickball game a couple weeks ago. Some friends from church invited the team to the countryside for some berry picking and hiking. 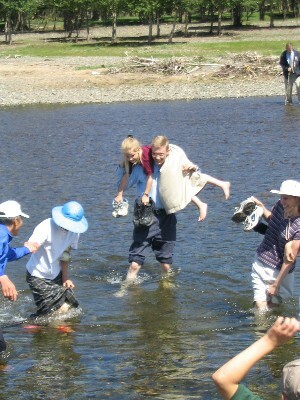 Here Isaac fords the stream with Rebecca on his shoulders. 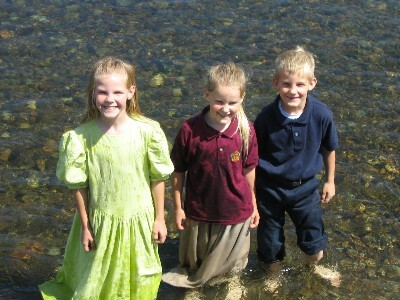 The water was cold, but this did not stop three young Wallers from making the most of it. While the ladies went swimming, several of the guys climbed a nearby mountain. In the valley behind me we picked berries that are similar to the chokecherries I have seen in America. The round tent-like structure is called a ger. 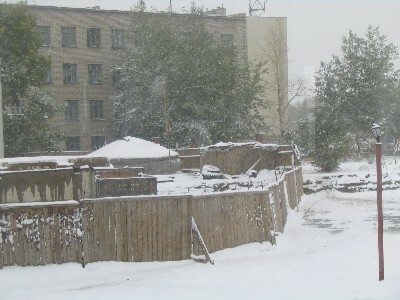 (Pronounced “Gare“) This is the traditional Mongolian home, and is commonly seen, even in the city. In spite of overcast skies and light rain that morning, the Lord answered prayer and gave us a beautiful sunny day in the countryside. In the photo above you can see the returning clouds and rain on the horizon as we left. Last week I was reading Psalm 23 again, and came to the familiar verse: “Thou preparest a table before me in the presence of mine enemies: thou anointest my head with oil; my cup runneth over.” I saw something that I had never noticed before. David wasn’t saying “Lord, my cup is too small, look at all the water that is getting spilled!” “I just can’t catch everything!” Instead, he was simply grateful that his cup was full and running over. Here in Mongolia there are so many opportunities all around us. Requests for trainings come almost weekly, and we see so many potential things that we could do, if we had the time and staff. A large number of projects stand just waiting for us to get the chance to work on them. Instead of feeling overwhelmed, if we look at these opportunities as blessings from the Lord, we can thank Him that “our cup is running over”. We could be sitting here wondering what to do, but God has poured out such a rich array of projects that we need His wisdom in knowing what will be most important to work on. I started thinking about this a little more. Why is it that a sand pile represents hours of joy to one person, and hours of toiling drudgery to someone else? The difference is in their perspective. The child sees the sand in front of him and makes good use of a small portion. The workman thinks only of how long it will take to move the entire pile. We don’t have to take responsibility for “moving the whole pile.” We just need to be faithful with the things that God has put before us to do. We don’t have to move the pile for God, He wants us to rest in Him so that He can show His power in accomplishing His will through our lives. Realizing that somehow there must have been a mistake in communication, we both felt that it would be good for me to go to MIU on Monday afternoon, just in case they were expecting me to speak. A very full schedule on Monday morning left virtually no time to prepare for the lecture. I decided to share on the quality of sincerity, since that is what we had just taught in our character-English classes a few days before, and after a hasty lunch, I picked up my folder and headed out the door. Pausing to pray in the stairwell, I asked that the Lord would somehow allow me to share effectively with the MIU students. I recalled many times last year when the Lord showed His great faithfulness in equipping me to do what He brought before me. Arriving at the school a few minutes later, I tried asking a few of the students where the “Management Research Team” was meeting. We tried calling a cell phone of one of the students, but the Lord had orchestrated that right at that point the girl that Tim had talked to on Sunday walked in and was able to bring me to the class. As it turned out, Leo was very surprised, but delighted to see me! He introduced me to the class, and asked if I could share with the students. Looking around at the 20 or so students around the table, I took the pen knife out of my shirt pocket. (I had felt prompted to grab this as I was going out the door a few minutes earlier.) A pen cap was on the end, concealing the blade. From all appearances it was just a pen, everyone agreed, until I revealed the small blade inside. “Sincerity”, I began, “is being the same on the inside as we appear to be on the outside.” For the next hour, the Lord enabled me to have a most focused and clear explanation of the first “I will” of sincerity. Personal illustrations came to mind as I shared freely on the importance of choosing our friends and how we spend our free time. Why is it that some of my best messages are given after the least preparation? Maybe it is that the excellency of the power would be of God, and not of me. (See 2 Corinthians 4:7) God again was showing me that it was not my “skills” but His grace that enables me to do what He sets before me. 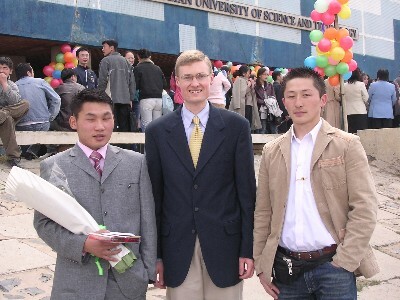 Not everything in the Christian life is “smooth sailing.” CTI-Mongolia is no exception. One of our recent challenges has been with getting some paperwork processed for my family to be able to come to Mongolia. As an Non-Government Organization, we were renewing our three-year NGO certificate. Although we had submitted our paperwork over a month prior, our NGO application had still not been processed. Causing cascading delays on other paperwork that we were trying to process, we were told that we could not apply for a work permit for my Dad until we had our NGO certificate back. A work permit was needed to begin applying for visas for my family, and the rapidly approaching arrival date of June 25th caused no little pressure for Tim and those involved. It seems that some of the officials in the labor department were concerned about our organization and wanted to know why we keep trying to bring foreign staff to Mongolia. The fact that Tim had appealed to a higher authority several months ago about some other issues seemed to only further strain the relationship. In America, we are more familiar with just filling out forms and having them accepted or rejected based on clearly defined criteria. Here, it seems that more responsibility is given to the authorities themselves, so this gives them the ability to assign more “homework” if they have concerns about what you are doing. This also gives a real opportunity for the Lord to work in the heart of our authorities. “The king’s heart is in the hand of the Lord, as the rivers of water: he turneth it whithersoever he will.” – Proverbs 21:1. This was clearly seen last week as Jedidiah and Cindy appealed to the labor department officials. To our great surprise, the official was very friendly with us. He looked over our papers, and said that we could go ahead and submit them for the work permit! Instead of having to translate more letters or obtain further paperwork, the way was opened for us to move forward! Jedidiah and Cindy returned and we all praised the Lord for His working in this situation. Meeting the next day with the Foreign Affairs Office, things again were able to move forward without further delays. This is a tremendous blessing, saving us the additional time involved, and the added expense of having to expedite things at the last minute. Please continue to pray that the Lord would allow the final details to come together in the next few days. It is exciting to see not only the opportunities that God brings, but also the wisdom He gives in responding to unexpected situations and questions in a gracious way. This, of course, is a big learning experience in itself, but I believe that God wants us to be able to respond graciously when others ask a reason of the hope that lies within us. There is so much more that I could write about! The Attentiveness training in the Sangalkharkain district last Wednesday could fill an update by itself! But I must bring things to a close here. Thank you again for praying with us! God is truly doing a great work! – Praise the Lord for how He worked things out for my family’s work permit and visas! 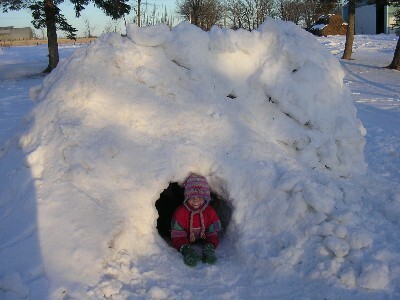 It looks like we will have things finished in time for them to get their visas in the next few weeks before they come. – Thank you for praying for the training in Sangalkharkain last Wednesday! We had a wonderful day teaching on the character quality of attentiveness, and even the seasoned Police officers were getting involved in the discussions and activities. Byato from World Vision translated for most of the day, and showed great enthusiasm and leadership with the group. – The Intermediate English classes have been going very well. I have never taught English before, so this has been a new experience for me. The greatest need for the students is for conversation practice, so most of the class consists of encouraging and guiding them as they practice speaking. By speaking slowly in simple sentences, I am able to do most of the class without needing additional translation. – Thank you for your prayers for the database project with Joshua Reimer! Tim allowed us to take several days to focus on this project, and the Lord allowed us to make some major progress. I hope to send Joshua the updated files next week. – Pray that the final details of Mongolian visas would come together for my family. It has been exciting to see how the Lord is working in this situation. – I am expecting the software licenses to arrive sometime early next week, so pray for wisdom as I begin the process of upgrading our computers and setting up a server for our network here. 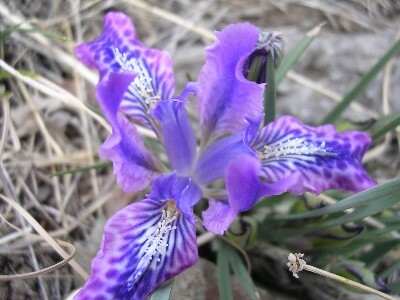 I found this beautiful flower growing on the side of a mountain that we climbed last Saturday. You can compare its size to the blades of grass around it. 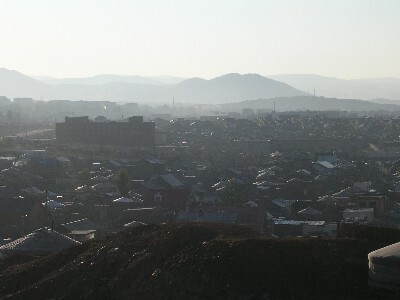 A view of the east side of Ulaanbaatar from a mountaintop. 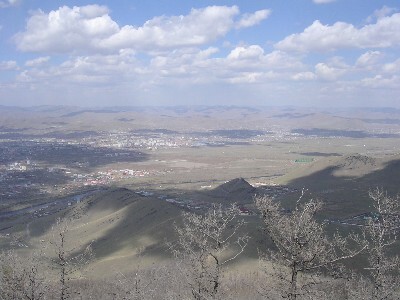 The small mountain near the center of the picture is where tourists usually get a view of the city. Five of our staff and a Mongolian friend that joined us for the hike. The CTI team last Saturday. Joshua and Kate returned to their home in Australia on Tuesday, and the Lim family returns to Singapore tomorrow afternoon, reducing the number of staff to 8. 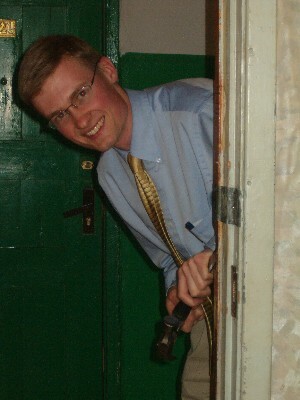 Evening work projects can take various forms, including repairing the latch for the door to our main apartment. Greetings from Mongolia! Looking out the window I can see the bright sunshine on the buildings and trees, with a slight haze obscuring the mountains beyond the city. The weather has been a little cool as the heat was turned off for the summer the week I arrived. We even got to see some light snow flurries a few days later. Quite a lot of things have transpired since my last update, as I am sure you can well imagine. I will just try to share a few highlights from the past three weeks. The Oklahoma City Training Center was hosting the Oak Brook College of Law graduation the week before I left, so I was glad to be able to help out with the added work load for evening chore time when the guys do the dishes and kitchen cleanup. Looking back, I am so grateful for how the Lord loved me so much that he wanted to teach me a very important, although difficult lesson. Having the spiritual gift of serving, I really enjoy working to meet the needs of others. However, there is a subtle danger in seeking approval from those that I am serving, rather than from the Lord. I can not think of a set of circumstances where the Lord could have more clearly showed me this difference, and while I greatly enjoyed this opportunity to serve Dr. Gothard, there were a couple situations where my inexperience allowed me to fall short of doing what was expected. Visiting the Diamondback Correctional Facility was a most memorable experience! Driving over an hour West of Oklahoma City, we finally caught sight of the prison, far off the road, and just barely peeking over the grassy rise before it. Rows of fencing and razor wire glittered in the sun, securely enclosing the privately owned compound. Meeting us outside, the chaplain led us through several gates until we reached the office where we presented our photo ID and passed through the metal detector. Stopping to share a brief word of encouragement with some of the staff at the prison, Dr. Gothard inquired a little more about the inmates. The pod that we were scheduled to meet was comprised of 120 men, all from Hawaii. Most were serving life sentences for second-degree murder, manslaughter, and other serious crimes. Responding to a faith-based initiative, all of these men had watched the Basic Seminar by video, where Dr. Gothard presents seven Biblical principles for life. Joyful, radiant faces beamed as shouts, cheers and applause filled the air. Brightly colored streamers and decorations hung from the railing above, and a huge banner proclaimed the seminar motto: “Giving the World a New Approach to Life!” Like a returning hero, Dr. Gothard was ushered to the front of the central area where chairs had been arranged for Dr. Gothard’s address. The air was electric with enthusiasm and joy as the ovation continued for several minutes. As the men regained their seats, one of the prisoners came to the podium and read a very formal welcome in English, pausing at each paragraph to translate it into his native Hawaiian language. He then presented Dr. Gothard with a Hawaiian lei, intricately crafted from white paper napkins. The tastefully designed program continued with some songs by a group of the men, sung in English and Hawaiian, and one of men quoted the entire chapter of Romans 6. My eyes traveled across the group, seeing on many faces the visible scars of the past, yet beaming with a joy that only God can give! 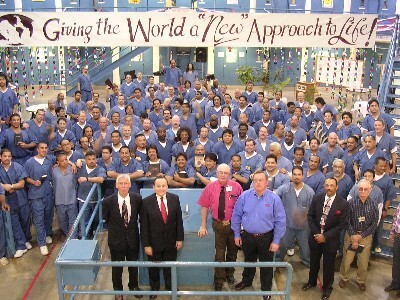 These men may be behind bars, but they have found freedom inside! One after another, men came to the podium to share testimonies of God’s work in their life. Often choked by emotion, but strengthened by shouts of “Amen!” “That’s right!” “It’s okay, man!” coming with tender love from their fellows. Tears running down his cheeks, one man shared how he finally sees light at the end of the way. Others shared of how they have been sharing these truths with their families and loved ones. One man told how his Mother had stopped reading her Bible and almost given up all hope, when he had the opportunity to tell her how his life had been changed -for the better! Another shared how for the first time he saw God’s love in allowing him to go to prison where he learned truths that he might never have heard outside. Looking around the room, I could see the same cells, doors and gates that were in the other pods, but here something was drastically different. 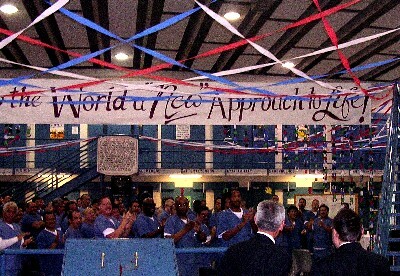 Brightly colored posters with Scripture verses adorned some of the cell doors, character qualities written out on poster board surrounded the room, and a large sign in the center displayed a resolution that the prisoners had written for their pod. The time went all too quickly. 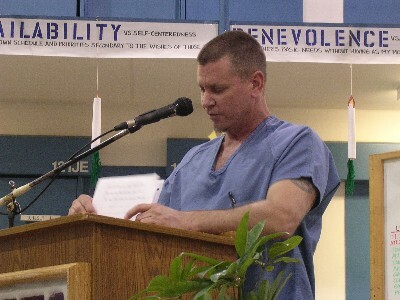 After Dr. Gothard’s address, the men presented him with an honorary “scrub,” a blue shirt like what each of them wear, but signed by all the members of the pod. Crowding around Dr. Gothard, the men personally thanked Dr. Gothard for all that they had learned in the Basic Seminar, and held out Bibles for him to sign. Many of the prisoners also greeted Isaac and I, and shared how their lives have been changed. One man asked me how his family back home could hear the seminar. We were past our allotted time, and the men reluctantly gathered near the door for some final photographs before we were obliged to leave. It would be impossible to adequately describe the two hours we spent at the Faith Pod, but it was an experience not to be forgotten. The same power, I had told them, that has transformed their lives, is what enables us to live the Christian life outside. “You won’t find that in a thousand prisons,” Dr. Gothard commented to us afterwards. Reflecting on the Christian love and joy that we had so clearly sensed there, I wondered if you would find that type of atmosphere in a thousand churches in America today. Sadly, so many churches have left the life-changing power of applying the principles of God’s Word to our lives, and instead have turned to empty activities and worldly entertainment. Here in Ulaanbaatar, I continue to marvel at the opportunities that God has set before us. A nation with a whole generation of new Christians, hungry for solid Biblical teaching from the Word of God. We don’t have to look for things to do and ways to reach out. We can’t even cover all the invitations and requests that come to us for teaching English, Character and Biblical trainings. There are so many other things that I could write about, but I must bring this update to a close. Many needs all around us beckon for our time. Pray that the Lord will give us wisdom as we reach out in His love to those around us. – Praise the Lord for working out the details of my return to Mongolia. I was able to get a work permit in answer to prayer, and the Lord worked out my flights, in spite of being sent the wrong ticket less than a week before my departure. – I am grateful for the opportunity to spend a couple weeks in Oklahoma City, just before returning to Mongolia. The Lord greatly blessed the computer project that I was working on, and I was able to have some very good times sharing with Isaac, Rachelle and David. I also greatly enjoyed spending a day in the Oklahoma City schools, teaching Character First! with David. – The Lord worked out the opportunity for me to attend the university graduation of Nyambayar, Cindy’s cousin that came to Christ last fall. I was encouraged to hear that he would like to meet for more Bible studies together. Pray that the Lord would allow the details of this to come together. – Joshua Reimer and I visited the Mongolian International University to see about the possibility of using their facility for larger seminars in the days ahead. In the course of the meeting Leo and several other friends from MIU came up to greet me. Leo and a friend invited me to speak at their student club, and it sounds like some other students are working on a proposal for us to teach at their school again. – We were able to order some (legally licensed) software from a distributor in Russia for a reduced price, due to our status as a Mongolian NGO. Pray that the Lord will give me wisdom in upgrading our computer systems and network here over the next few weeks. – After a meeting yesterday, we have scheduled a character training in cooperation with Word Vision, a Christian based organization in Mongolia. We are scheduled to teach an all-day seminar to thirty community leaders from some areas of poverty and higher crime rates. Pray that the Lord will use this training in a powerful way, as most of these leaders are unsaved. – In recent days I have been spending some focused time working on a database project for IBLP Australia. I started this project when I was in Melbourne in 2003, and have been working on it remotely from time to time. It has been a blessing to have Joshua Reimer from Australia here in Mongolia where we can work on it together. Pray that the Lord would bless our efforts and that we would continue to make rapid progress. 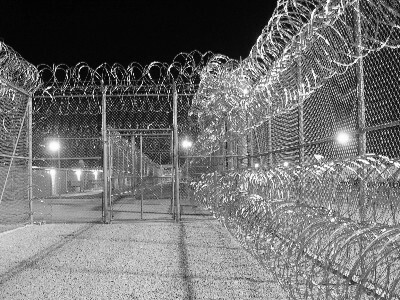 Seeing the array of razor wire and fences, it is little wonder that not a single prisoner has ever escaped from the Diamondback Correctional Facility. A jubilant greeting from the men of the “Faith Pod” as the Chaplain and Dr. Gothard enter the room. One of the prisoners shares how God has changed his life through the message of the Basic Seminar. All the men gathered at the end of our visit for a group photo with Mr. Gothard. I was able to drive to the prison the next week, bringing for each of the 120 men two of Dr. Gothard’s recent books. 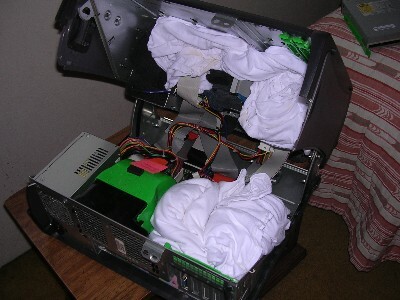 I found it quite amazing how much clothing you can fit inside a computer. 🙂 Careful packing allowed me to carry three badly needed desktop computers to Mongolia without going over my baggage limits. Arriving at CTI on the week of a Basic Seminar in English and Russian, an Advanced Seminar and a Children’s Institute, I had the opportunity to help out in some skits for the Children’s Institute. 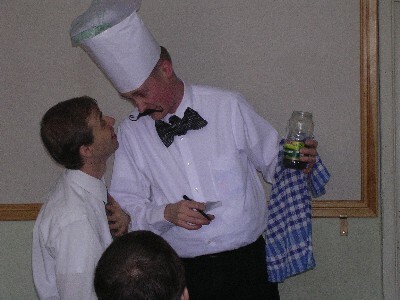 Here a “French Waiter” tries to explain to his friend why we must test what kind of water we drink in the desert. I am so grateful for all that God is doing here! – And to hear the exciting reports from back home! Please continue to pray for us as we serve together in this ministry. A week ago today, I loaded my suitcases into the trunk of the rental car, leaving St. Paul Minnesota just before 5 AM, I started on the longest trip that I have ever driven. Thirteen hours is probably not much for some of the road veterans out there, but for a guy that had never driven longer than a couple hours at a time, it was a new experience. I had brought a stack of cassette tapes to help keep me alert on the drive, but discovered that the rental car was of a little more modern design, only having a CD player. With some more prayer as I started out, I saw God’s hand of faithfulness with me all the way. The full size Buick Century even got 35 miles to the gallon, saving me extra fuel costs. – An answer to prayer. Enthusiastically greeted in Oklahoma City by David Isaac and Rachelle, it was great to join in on the projects and work teams at the Character Training Institute. I am primarily focusing on some computer work with Jonathan Camenisch, but it has been great to be involved in a number of other projects as well. I know that a number of you had been praying about the computers that I was wanting to purchase last week. I had found some computers on eBay that seemed like exactly what we needed in Mongolia, and bidding in the last minute of the auction, Derrick and I were able to get six computers for an average of $47 each! Four of these are for Mongolia, and I trust that God will use them to be a blessing to the team over there. I also wanted to share a little update on the work permit situation in Mongolia. In my last update I described how God had answered prayer in giving us favor in the eyes of the authorities, and everything looked clear for my family and I to join the team in Mongolia in the next few months. The day after I sent my update, further meetings with the Mongolia Labor Department officials took an unexpected direction. While the Minister of Labor was very understanding and supportive of our work, we were told that she really did not have the authority to go beyond the provision of the law and grant us permission to obtain work permits, unless we could prove that we specialized in teaching a foreign language. We are currently in the process of applying for a certificate from our District Manager that officially states that we teach English as a foreign or second language. I find it very interesting that teaching English is actually one of the three purposes of CTI-Mongolia, as described in our NGO statement. Even more amazing is the fact that while we were not seeking this objective, the Mongolian government leaders had insisted that we have this purpose listed in our NGO document! So often it is in the very things that we don’t understand that we later see the hand of the Lord working through our authorities for our good and His glory. So, in summary, it looks like the Lord is continuing to work out this situation, and while we don’t have the final word, I trust that God will work things out for good according to His purpose and will. It sounds like many of the other organizations may be waiting until the law is reviewed again next year, rather than attempting appeals to the Prime Minister and President just before the national elections. This week in Oklahoma City we are hosting a conference for the Oak Brook College of Law, so it looks like it will be a full weekend. There is a possibility that I might be assisting one of the guests over the weekend, so pray that the Lord would give me wisdom as I focus on His priorities in my final week in the States. – Praise the Lord for allowing us to purchase all six of the computers that we bid on last Wednesday! My family was able to pick them up today, and the one we purchased the week before is already running as the family computer. – The Lord has been using this time in Oklahoma City to be a great encouragement to me as I see His hand at work in many little ways. The divine appointments to share a word of encouragement with someone, and the ability to help out in areas of need continue to confirm the Lord’s direction in my time here. – Praise the Lord for working out the final details for my airline tickets. I am scheduled to fly out of Oklahoma City on Saturday morning, April 30th, and arriving in Ulaanbaatar, Mongolia on May 1st. – This Saturday my twin brother Isaac and I are scheduled to take Dr. Gothard to the Diamondback Correctional Facility in Watonga, OK for a two hour meeting with inmates from the “Faith Pod.” These inmates are all from Hawaii, and have recently been through the Basic Seminar. Pray that the Lord will use the time to be a real encouragement to them, and that He will give wisdom to Mr. Gothard in sharing and answering questions. – Pray that the Lord would continue to give wisdom as I work to prepare the server computer for CTI-Mongolia, and that He would bless my remaining days of work here before I travel to Mongolia at the end of next week. 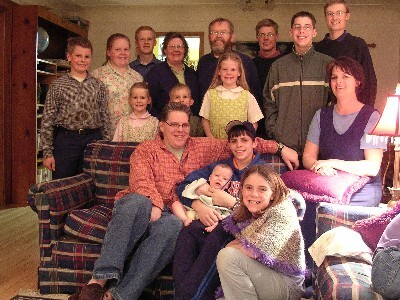 – Please pray for my family as they travel to Oklahoma City to host a Basic Seminar in Guthrie Oklahoma next week. David is working hard to prepare for the Children’s Institute. Pray that many lives would be touched as the truths of God’s Word are brought forth. I did not have time to take many pictures this week, but I thought I would include one of the Character Coaches. Every day, this team of young people go into the public schools in Oklahoma City, teaching lessons on character, and leading after-school Bible Clubs. You can see my brother David on the far right. It is really exciting to rub shoulders and hear what God is doing here in Oklahoma City. Two more children came to Christ at a Bible Club a few days ago. I really appreciate the Godly leadership and focused atmosphere of this outreach to the children of Oklahoma City. Thank you for your continued prayers! May God bless you for your unseen support in prayer! This gave rise to some serious concern among many non-profit type organizations, including CTI-Mongolia and other Christian ministries in the country. We were told that the government officials were holding strictly to these terms, and would not allow any new visas or work permits to be granted until this requirement was met. I was greatly encouraged to hear from several of you that have been praying for this situation. I know that some that have brought this prayer request to their churches and prayer groups, asking the One who holds the heart of the king in His hand, that He would grant us favor in the eyes of the authorities in Mongolia. When further appeals to our local labor department officials were denied, our director Tim set up an appointment to meet with the Minister Labor for the nation of Mongolia. On Friday afternoon, Tim and several of our staff met with the Minister of Labor. Discovering that she spoke English, Tim was able to speak directly with her about our situation. The Lord truly prepared the way. Not only was she familiar with English teachers, but she has actually started her own college with foreign teachers. Understanding our situation, she agreed that it would be impossible to have a 95% Mongolian staff ratio for this type of educational/service-oriented organization. She told us that CTI-Mongolia should be considered an educational organization, falling under the 70% foreigner / 30% Mongolian staff category. Not stopping there, she went on to call our local Labor Department office, and actually ended up speaking with the very official that had been giving us so much difficulty! Clarifying that CTI-Mongolia is not required to hire additional Mongolian staff, the Minister of Labor arranged for a meeting on Monday to discuss these issues with all the Labor Department staff. We are so grateful for the way that the Lord has again demonstrated His power in this situation! I have not heard any further reports from the Monday meeting, but it looks like the Lord has cleared the way for my family and I to obtain work permits for our time in Mongolia. Please do continue to be in prayer as the remaining details are worked out on the work permit issue. While we are grateful that CTI-Mongolia will not be hindered by the new law, a number of mission organizations and Christian ministries still face difficulties in obtaining new staff. It seems that the primary issue is that there is no specific provision for service-oriented organizations. You may also remember the prayer request for wisdom as I work to obtain some computers and software for Mongolia. Last Wednesday I was checking prices on used computer systems, and came across some interesting listings on eBay. Apparently deciding to upgrade a large number of computers, the Minnesota Public Library was selling a number of their older desktop computers. When it looked like they would go for a surprisingly low price, I put in a bid, and got a computer (PIII 800mhz,128m Ram, Win2K Pro, Office 2K) for $46! The seller only accepted local pickup for shipping, so this factor seems to have limited the bidding on these computer systems. – Much to my advantage, since we could pick them up at a library branch an hour away. Another group of 10 computers is scheduled to finish their auction on Wednesday, so Lord willing, I hope to purchase several of these for my family to bring to Mongolia in June. I am just amazed at how the Lord seems to have worked this out! I just “happened” to come across these computers the day the auction ended, they just “happened” to be in our local area, they just “happened” to be exactly the kind we need in Mongolia, they just “happen” to have licenses for the software we need, I just “happen” to have gotten one to inspect before I leave for Oklahoma in a few days, there just “happens” to be another batch for auction the next week, my family just “happens” to be able to take them to Mongolia when they come in June. No, I don’t think it just “happened.” I think that God may be orchestrating something here, something I could never have done on my own! In situations like this, I am reminded that God’s blessing is the most important asset I can have. The Lord continues to bless these remaining days at home. Just today I was able to confirm plans to travel to Oklahoma City to spend a couple weeks at the Character Training Institute headquarters before heading back to Mongolia on April 28th. Yesterday we were invited by friends in Minnesota to visit their church and share a little about our plans for Mongolia. I know that their church has been praying for my family and I, and especially the work permit situation last week. It was a great joy to be able to share the fresh report of God’s answer to our prayers. It was a special joy and encouragement for me to talk with several young men that are growing up with a heart for ministry and a desire to whole-heartedly serve the Lord. That evening we visited another small church in Minnesota. My family has visited there a few times in the past, and they recently invited me to come and share about the work in Mongolia. God again poured out a blessing on the service as I showed slides and described the work. 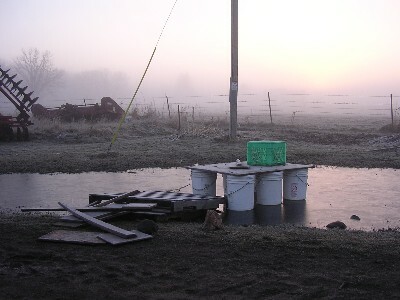 These next few days will likely entail much packing and preparation as I leave our farm on Wednesday evening. This time at home with the family has been a special one with many rich memories not soon to be forgotten. – Praise the Lord for the answers to prayer in relation to the work permits! The way that God has opened the door brings further encouragement as we take this next step of faith for our family. 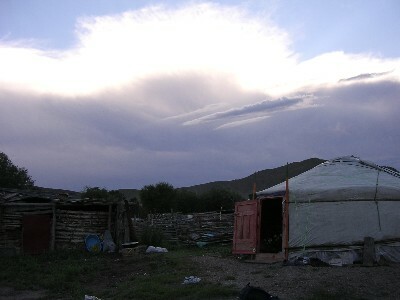 – I am grateful for the Lord’s hand of guidance in finding a source to potentially purchase some computers for CTI-Mongolia at a low cost. – Pray that God will give wisdom in how I spend my time in the next two days. 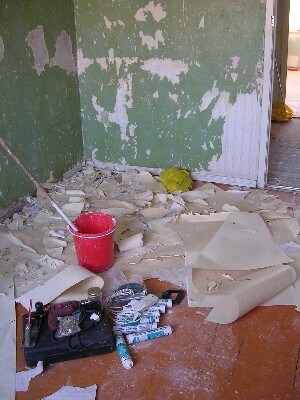 Much packing and completing of projects needs to be balanced with spending time with the family. – Pray that the Lord would prepare the way and allow me to be a blessing and encouragement to the team in Oklahoma City as I spend a couple weeks there. 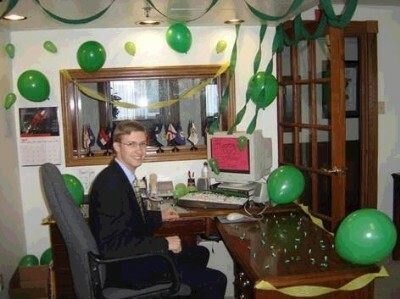 My sister Rachelle surprised Isaac this morning by decorating his office in Oklahoma City for his birthday. – Did I mention that his favorite color is green? Who says you need a ladder to reach the spaghetti noodles? 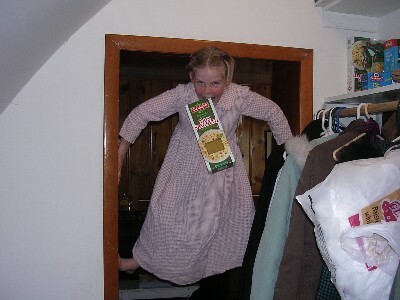 Lydia demonstrates her doorframe technique. One of the recent projects of the younger Wallers was to design a boat to take advantage of some standing water in our yard. 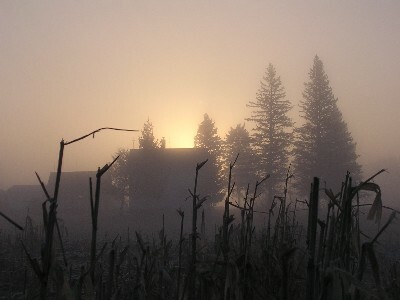 The farmhouse at sunrise last week. “I’d like to see what the other guy looked like!“, These and many other unsolicited comments were patiently endured by Matthew after he accidentally bumped his eye on Samuel’s knee. 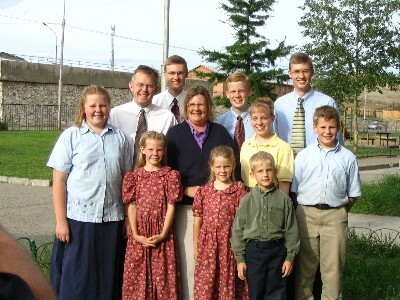 For many years my parents have had the vision of serving as a family in some type of mission work. As a newly married couple, they began making plans to serve in Liberia, Africa, but God changed their direction to that of raising a Godly generation. 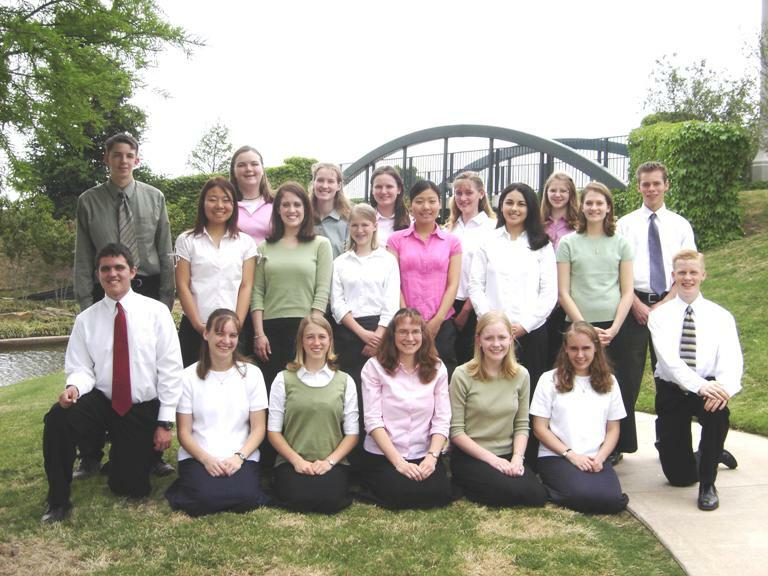 Over the past 25 years they have labored diligently to train us in the ways of the Lord. 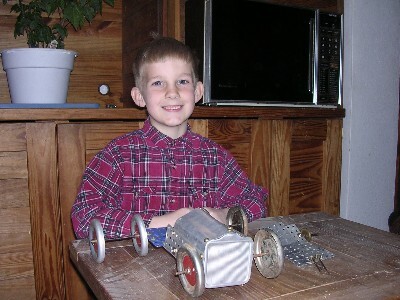 Making the decision to homeschool when Isaac and I were six years old was possibly a bigger step than it would be today. As pioneers in the homeschool movement they faced a great deal of misunderstanding from family and friends. When I tell some people about my parent’s decision to homeschool us, and they learn that there are 10 children in our family, they often say “Your Mother must be an incredible woman!” Well, I would have to say that she is, but it is through God’s incredible grace and faithfulness! God is the one that gives us the motivation and power to continue on, and to go back and make things right when we fail. We are still very much a work in progress. God is continuing to teach us new lessons in faith and trusting Him. Although we often fail, God has never failed to honor the promises of His Word. We have seen times of great provision and steady work, and we have also seen a few years ago when no steady work for nine months caused our finances to dwindle to almost nothing, -then God showed His power in providing my Dad with a very good job that has supported us since. Like arrows launching out, the older ones have begun reaching out in various ministry opportunities in the past several years. I have had the opportunity to work in Oklahoma City, Australia and Mongolia, serving in a variety of capacities, but primarily in computer work and character education. Reaching new levels of maturity, the younger ones have been taking on more responsibilities at the farm and various short-term ministry opportunities, giving us more mobility as a family, and allowing us to reach out with increasing effectiveness. In this new season for our family, God has been working over the past several months in opening the way for us to serve together in Mongolia. In the past few weeks God has provided for us to be able to purchase 10 airline tickets, leaving on June 23rd for Mongolia. Right now, the plan is that I would return to Mongolia on April 28th, and the rest of the family would come on June 23rd, with Derrick following a couple months later after wrapping up some farming projects. We are planning to spend six to nine months serving with the Character Training Institute, the same organization that I served with for most of last year. We are all tremendously excited about this opportunity, and encouraged to see the Lord’s provision and confirmation along the way. I have been teaching the family a few Mongolian words, and we have had many discussions about what things are like in Mongolia. As you can probably well imagine, great opportunities for doing much good often come with great opposition from the enemy. I received some very unexpected news this morning from our Mongolia team. Stopping by the Mongolia Labor Department office, Jedidiah and Dumaa wanted to confirm that I just needed to pick up a Blue Card (work permit) when I arrive in late April. Much to their surprise, they were told that a new law had been put in place regarding foreign workers. In the past we have been able to operate as an official NGO, (Non-Government Organization) which only required us to have something like 40% of our staff be Mongolian nationals. A new law states that NGOs must now have 95% Mongolian staff. This would mean 20 Mongolian employees for every American staff person! We had heard some rumors from other organizations about this new law coming, but this was the first time that we had actually confirmed it. Since we only have five Mongolian employees right now, we were told that the Labor Department would not give us any more Blue Card work permits. This reminds me a little of an incident that took place last December when Derrick, Rachelle and David were going with a team to the Philippines for a three-week missions trip. A few days before they were scheduled to leave, they discovered that the broker had not purchased the airline tickets, could not account for over $15,000 that had been given to him for this purpose. I believe that God sometimes brings us to impossible looking situations so that He can demonstrate His power to the world. “For the eyes of the Lord run to and fro throughout the whole earth to show himself strong in the behalf of them whose heart is perfect toward him.” – 2 Chronicles 16:9a. Proverbs 21:1 says: “The king’s heart is in the hand of the Lord, as the rivers of water: He turneth it whithersoever he will.” Please join us in prayer that God would move in the hearts of the government officials as we appeal to obtain work permits to continue the work in Mongolia. 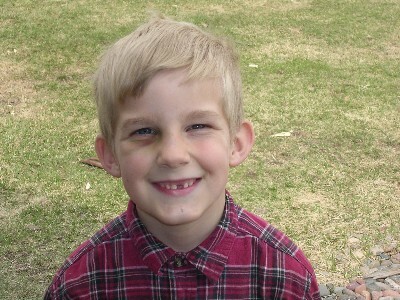 – My 18-year-old brother David was able to spend a few weeks with us at the farm over Spring Break. I am grateful for his energy-giving spirit, and wholehearted investment in our family before heading back to his work at the Character Training Institute in Oklahoma City. – Praise the Lord for providing the resources for our family to purchase tickets for the trip to Mongolia. The excitement and anticipation continues to build as we see God opening up the way. – Please pray for the work permit situation in Mongolia. 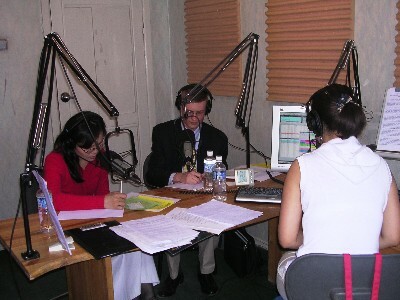 This not only affects CTI-Mongolia, but a large number of other Christian ministries in Mongolia. Our director Tim is planning to discuss this with several government leaders that we are currently working with. Pray that we would have continued favor in the eyes of our authorities, and that God’s direction would be made clear. – Pray that the Lord would give wisdom in how I use these next few weeks. 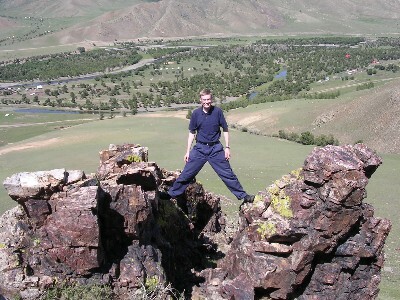 The uncertainty with the Mongolia Work permit situation could possibly delay my return to Mongolia at the end of April. I know that God will work out the timing of my return if His will is for my family and I to serve in this field. 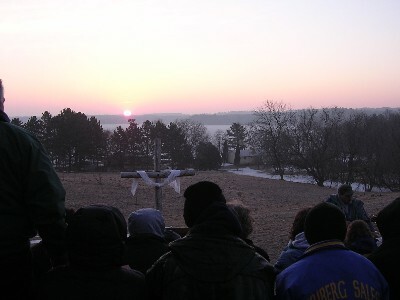 This year we had the opportunity to attend an Easter sunrise service near our home. Over 50 people came for the outdoor service at 6 AM. 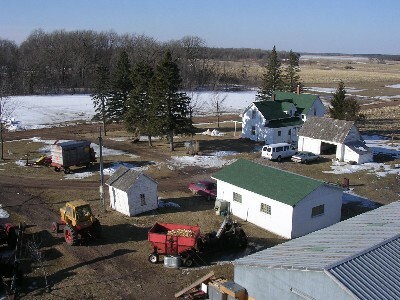 This is a view of our farm from the silo. Spring is here! – And so is the mud. Derrick’s tractor ended up working much better than the board for returning the van to the driveway. 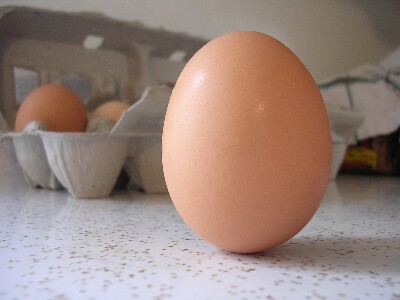 Have you ever balanced an egg? Near the spring equinox, a steady hand can accomplish this interesting feat. 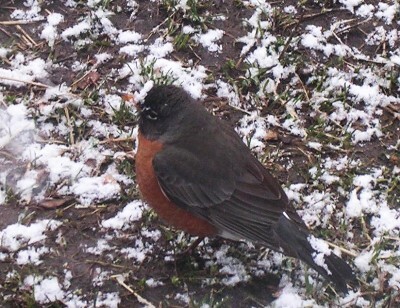 This poor robin got caught in an unexpected snow this morning. Thank you for standing with us in prayer! I am looking forward to seeing what the Lord does in these next few weeks! Some of you might be interested in receiving updates on the work going on in Mongolia. Carissa Gay sends out a weekly e-mail with two praises and two prayer requests outlining specific ways to pray for the ministry there. If you are interested in receiving these, please send Carissa an e-mail at cgay@ctimongolia.com, and she would be happy to add you to the list. I don’t always have the time to touch on all the issues in my updates, so you might find these additional e-mails helpful in praying more specifically for the work. 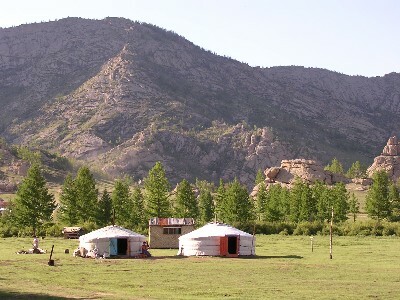 Thanks again for your Interest in Mongolia! These have been some busy, but fruitful days here on the home front. Realizing that God uses our families to “sharpen” our character and take off our rough edges, I had prayed that God would use this time at home to cause me to stretch and grow. My idea of moving the home office upstairs and rearranging furniture in our small house presented a few challenges, or character-building opportunities, with so many ideas involved. Nevertheless, I think that we have been able to make some very good changes that will help us to operate more efficiently. Seeing the Lord’s hand at work in the past couple weeks continues to bring encouraging highlights in the midst of all the projects. Last Thursday I had the opportunity to join my family on the monthly visit to a local nursing home with our church. The hour of singing and brief message always seems to come as a great encouragement to the people there. It was amazing to see how many new faces there were after being away for a year. I hardly recognized anyone. It really gives you a perspective on how short life is, and how important it is to be able to reach out to these older folks, most of whom will be in one of two places for all of eternity a year from now. I have really enjoyed being able to spend time talking with Mom and Dad here. The time difference and occasional technical difficulties made extended communication from Mongolia a little more difficult. Technology has made great strides, but it is just not the same as sitting down on the couch together. With continuing progress abroad, it is neat to see how the Lord is also working right here in our area. On Tuesday I joined my family for the weekly follow-up course that they have been leading with a family in the area. This course takes the Biblical principles taught through the Basic Seminar (http://www.iblp.org/iblp/seminars/basic/) and brings them to personal application in our lives. God has a way of bringing His truth to our lives at most appropriate times. I have been memorizing some verses on loving others and going the extra mile, and the principle we studied on Tuesday evening was on forgiving others as we see God working in our lives through them. Family relationships give many good opportunities to live with a forgiving and patient attitude. It was very special to see the O’Brien family again. I had taught three of their children at a Children’s Institute seminar in 2001. That was really their first introduction to the IBLP ministry, and they have recently joined the ATI home schooling program, and are working to train their children in the ways of God. The joy and excitement that we see in their lives as they apply the truths of God’s Word has been rewarding for all of us. It is special to know that God is working in people’s lives, and sometimes has allowed us to have a little part in that work. We will never know all that God is doing until eternity, but we can trust that He is faithful to complete the work that He has begun. Another joy has been to have my younger brother David home for a few weeks during spring break. David has been working with a team in Oklahoma City, teaching character in the public schools, and leading after-school Bible Clubs for the students. God is really doing some exciting things there as well. While I am home, I have been working on several projects for Mongolia, with one of the main ones being to obtain software and a computer for our expanding needs there. The Lord really blessed in allowing me to clarify some licensing issues that would have cost us hundreds of dollars. I am doing some research to get a server computer and software solutions for our other computers over there. It is extremely difficult to find legitimate software licenses in Mongolia, but I know that God will honor our desire to do things completely honestly. God’s blessing is the most valuable thing we could have on our work, and is worth the “extra” cost. – Praise the Lord for the continuing progress on the Mongolian Bible Software project. Our translator Saraa is very excited about the program, and told us that it has been a great blessing to her life and work. – The Lord has allowed me to have some very helpful discussions with IT staff from IBLP and CTI, and profitable research as I continue to look for the best solutions to meet our needs in the technology realm. Last night I was able to purchase a used computer on eBay for a good price. 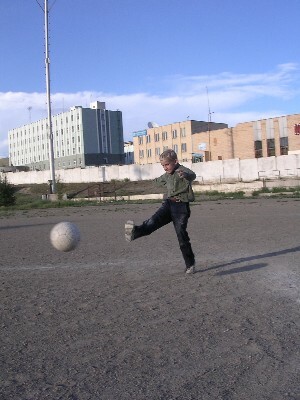 – Pray that I would be able to connect with just the right Mongolian that can help with the translation of the Bible Software program. – Over the next few weeks I plan to make some purchases of some computer hardware and additional software items for our network in Mongolia. Pray that the Lord would direct me to just the right items, and that I would be able to get them at a reasonable price. 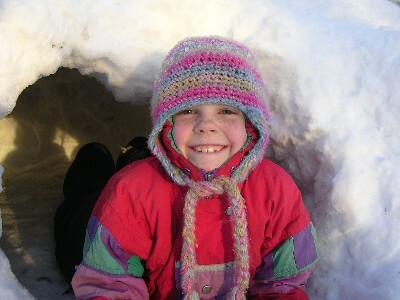 Lydia also enjoyed helping with the snow fort. 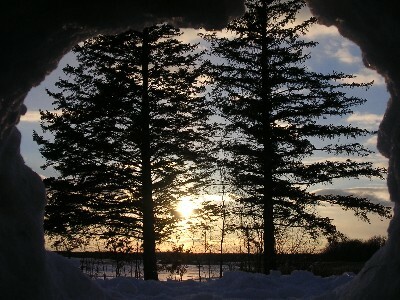 A Wisconsin sunset as seen through the door of our snow fort. 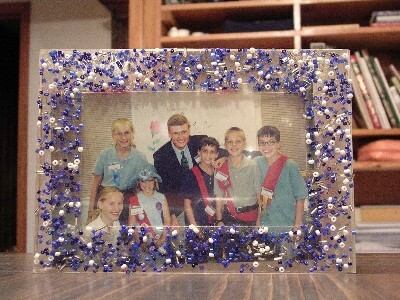 Reminding us of some special hours together in 2001, the O’Brien family still has a picture from the Children’s Institute. Now, four years later, our families are going through the Follow Up Course together. The younger ones have been having great fun with the Erector Set toys in the past few days. Here Matthew wanted me to take a picture of his tractor and wagon. Notice the dual tires at the back. Thank you for praying for me! I am grateful for your support in this way.